How to get to the Hong Kong Star Ferry terminal (where the star house buildings are) from Disneyland? Getting to the Peak from Disney, please Click Here (post dated May 29, 2011). Getting to the Avenue of Stars from the Peak via the Star Ferry, please Click Here (post dated May 26, 2011). You get to see the Giant Buddha and the rest of the attractions in the island via the Ngong Ping 360 cable car. Please Click Here to read about currency exchange. What is the most convenient way to go to the peak tram terminus from Disney Hollywood Hotel? I'm confused because most sites say I have to walk from Central Exit K, but I'll have to walk from Hong Kong station, which they say is a long walk. I found out that you could go to the star ferry terminal and ride bus 15C, but the question is how will I get there? I googled Hong Kong station and I can see the Star Ferry terminal, how do I walk there? Or, is it more convenient that I take the MTR to Tsim Sha Tsui and ride the Star Ferry to Central and board bus 15C? Also, if you got the roundtrip ticket, can you get off ngong ping 360 at the first stop to see the giant buddha and use the remaining trip back to tung chung? Or are roundtrip ticketers not allowed to get off at ngong ping and will automatically return to tung chung without making any stops? And is wing hoi worth it? We are staying in Lantau Island and they say its not worth it if you would go to Central just to save money as the savings would be eaten up by transportation costs, is the money changer in citygate ok? Or would exchanging money at the airport is not that much of a loss? Please click here for instruction in getting to Ocean Park from Tsim Sha Tsui. Just get into the TST MTR station few steps from Chungking mansions. From Ocean Park to the Peak then back to TST, please click here to find out the efficient route instruction. How to get to ocean park going to Victoria peak back to Chungking mansion at Nathan road. Please click here to read about detailed instruction in getting to the Hong Kong Macau Ferry Terminal in Sheung Wan from HK Disneyland. Re: How to Get to Star Ferry from Hong Kong Disneyland. If you're coming from Hong Kong Disneyland, here are the MTR travel time and fare comparison for you to consider. Based on the data above, taking the Hung Hom Ferry Pier is the fastest but I still recommend that you take the Tsim Sha Tsui Ferry Pier as it offers the most scenic views. Tsim Sha Tsui is where it called the heart of the city. Close to the Ferry Pier where you can find some other popular Hong Kong attractions like the Avenue of Stars, the Hong Kong Museum of Art and Space Museum, the well-known HARBOUR CITY for your unforgettable shopping experience. 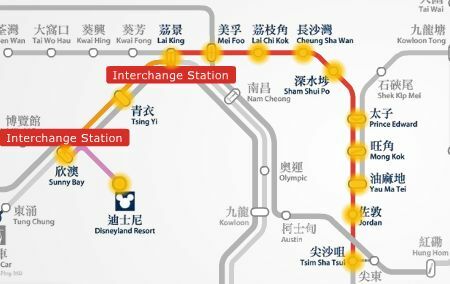 Here's how to get to the Tsim Sha Tsui Ferry Pier from HK Disneyland by MTR trains. Take the Disneyland Resort Line from Hong Kong Disneyland to Sunny Bay station. Then interchange trains to Tung Chung / Disneyland Resort Line towards Hong Kong station but you need to get off at Lai King station and again interchange trains to the Tsuen Wan Line towards Central station. Get-off at Tsim Sha Tsui station and take Exit F going to the Avenue of Stars which is adjacent to the Star Ferry Pier.